Dr. Tanja Babic is a neuroscientist who spent nearly a decade conducting neuroscience research and has published articles in various scientific journals. She received a PhD from the University of Western Ontario and worked as a researcher at the Pennsylvania State University. She is now a writer who enjoys explaining latest research findings to general audiences. The benefits of probiotics have been recognized for centuries, and in recent years both mainstream medicine and the food industry have become more interested in their role in preventing and managing conditions and diseases. Probiotics are foods and supplements that contain living organisms -- mostly live bacteria and some yeast. Their touted benefits range from digestive improvements to mental health. Probiotic-rich foods or supplements are often recommended for those with gastroesophageal reflux disease, or GERD. While probiotics may prove beneficial for symptom improvement, pain relief and prevention of GERD, more research is needed to understand their specific role in treating this condition. Probiotics are found in dietary supplements and in foods such as yogurt, sauerkraut and kombucha, a fermented beverage. Incorporating these beneficial microorganisms into your diet adds to the trillions that already line your digestive tract, where they help digest food, extract nutrients and provide protection against harmful bacteria and toxins. Although quality research is lacking, these healthy bugs potentially help to manage the symptoms of acid reflux that occurs when the acidic stomach contents travel back into the esophagus -- and the more severe form of reflux known as GERD. Most of the gastrointestinal benefits of probiotics stem from their functions in the intestines, or the lower gastrointestinal tract. However, probiotics may benefit the upper GI tract as well. A small study published in the September 2011 "Scandinavian Journal of Gastroenterology" found that participants who took probiotic supplements for 14 days experienced fewer of the common GERD symptoms -- such as nausea and regurgitation -- compared to those who did not take probiotics. Another study reported in the March 2014 "Journal of the American Medical Association" noted that infants who were given probiotics for their first three months had fewer gastrointestinal problems, including reflux, constipation and colic. Probiotics may also speed up stomach emptying. GERD symptoms are often aggravated after eating a large meal, partly because the pressure of a full stomach can push the stomach contents back to the esophagus. Another potential benefit of probiotics is reducing the growth of harmful bacteria, for example, H. pylori, a bacteria that causes ulcers and stomach inflammation. A review article published in the March 2007 "Journal of Nutrition" summarized nine studies of people infected with H. pylori, and seven of these studies showed reduced symptoms and lower H. pylori bacterial counts in the participants who supplemented with probiotics. However, in general, there is a lack of quality human studies on how probiotics help manage GERD symptoms. Inflammation is one of the main features of GERD. Excess acid in the esophagus causes inflammation resulting in pain and irritation of the esophageal lining. Probiotics have anti-inflammatory properties and can ease the symptoms of inflammation. A research report published in the October 2012 "Annals of Nutrition and Metabolism" reports that probiotics may reduce the production of inflammatory molecules. If these benefits are replicated in larger-scale research studies, probiotics may prove to alleviate GERD symptoms by reducing the pain caused by inflammation. People who are overweight or obese have an increased risk of developing GERD, and obesity can make existing GERD worse. The American College of Gastroenterology recommends losing weight as an effective strategy to alleviate some of the symptoms of GERD. In a small study of 125 women who were given either a probiotic supplement or placebo for 24 weeks, the women who were given the probiotic lost twice as much weight, as published in the November 2013 "British Journal of Nutrition." If larger scale studies prove this association, probiotics could play a role in preventing and managing GERD through weight loss benefits. 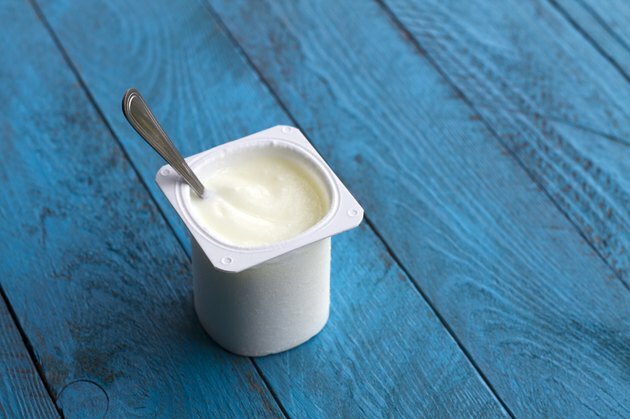 While the benefits of probiotics are intriguing, the research limitations are significant. There are many strains of probiotics, and much is unknown about the benefits of specific strains or even the optimal balance of different strains in the body. Additionally, since probiotic pills and powders are considered dietary supplements, they are not subject to the same rules as drugs. Some supplements could be of poor quality, with lower counts of probiotics or different strains than claimed. Although probiotics are generally considered safe, it is unknown whether they are safe in children or adults with severely impaired immune systems. Anyone who is pregnant, nursing or considering giving probiotic supplements to an infant or child should first speak to a doctor.If you experience the symptoms of acid reflux more than a few times a week or suffer from severe symptoms, talk to a doctor before taking probiotics. Scandiavian Journal of Gastroenterology: Dose-Response Effect of Bifidobacterium Lactis HN019 on Whole Gut Transit Time and Functional Gastrointestinal Symptoms in Adults. Annals of Nutrition and Metabolism: Probiotic Mechanisms of Action.